FCI Recruitment 2019 - Salary, Promotion, Job Role, Selection Process. 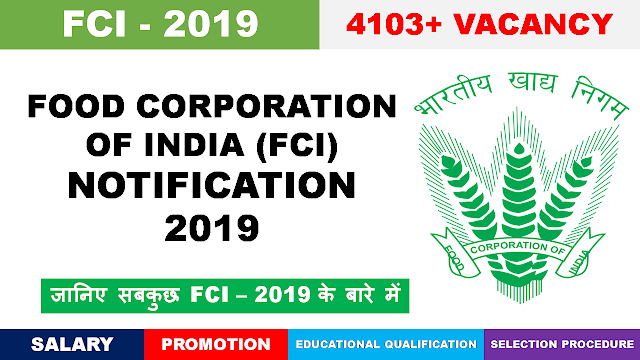 Food Corporation of India (FCI) has Officially released FCI Recruitment 2019 Notification for 4103 Post. Here in this Post we will Discuss about FCI Job Profile, In Hand Salary, Selection Procedure and Promotion. The role of Food Corporation of India is to maintain sufficient buffer stock in the country and price stabilization . FCI purchases food grains mainly from surplus states such as Punjab, Haryana and supplies them to deficit states. For example wheat is transported from Haryana, Punjab to Goa. A minimum support price is fixed by the government of India on which the purchase of food grains is done, but if a farmer gets more than MSP he is free to sell it wherever he wants. The Purchased stock is maintained in godowns aka depots by Quality control staff of FCI, under which fumigation and other procedures are carefully applied. Ministry of consumer affairs and Public distribution allocates a particular amount of food grains to Department of civil supplies, Department of education, Army supply corps. Under which they lift their allocated stock in time bound manner. There is also a scheme called OMSS or open market sale scheme where private parties purchase food grains from FCI, but this sale is done only when stock is surplus and may deteriorate if not processed or consumed. The supply of food grains for Mid day meal scheme ( Primary and upper Primary), APL ( Above poverty line),( Below poverty Line) BPL and other schemes ( SABLA, WBNP) is done by FCI. FCI Vacancy Details Zone Wise : Total 4103 positions are to be filled in FCI. Zone wise vacancies are as follows. Upper age limit for JE post is 28 years, Steno & Typist is 25 years, Assistant Grade II is 28 years and Assistant Grade-III is 27 years. Eligible and Interested candidates can apply online for FCI Posts from 23 February to 25 March 2019. The direct link to apply for FCI 4103 Posts is given below. A candidate can apply in any one zone only i.e. Either North Zone OR South Zone OR East Zone OR West Zone OR North East Zone. Typing Skill test and Document verification .